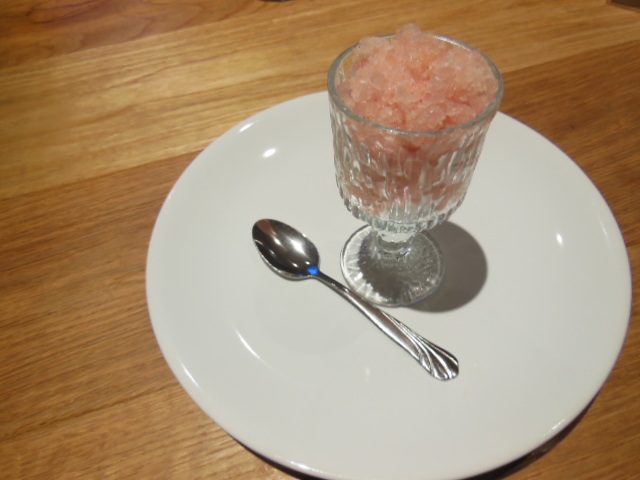 At every Walthamstowfoodies Supperclub we serve a sorbet, or looking at this week’s version, maybe it was more of a granita. Any way, this sorbet recipe is an easy, adaptable but time-consuming dish. It is a light and fat-free dessert and amazingly refreshing when the sun’s shining. Wash the rhubarb and cut into chunks. Put the rhubarb with all the other ingredients in a pan and cook gently until soft. Allow the softened rhubarb mixture to cool, then whizz in a blender until smooth. Taste the mixture at this stage, if it needs a little more sweetness add either some icing sugar which will melt-in instantly, or some more sweet ginger syrup. If it needs to be sharper then add a squeeze more lemon juice. Now if you’re going to be reserving this as an adult-only treat you can add a dash of something extra, we added Medenica which is a sweet Croatian honey raki. Freeze in an air tight container stirring every few hours to prevent it setting completely. You can keep this dessert in the freezer, taking it out and breaking up the ice crystals with a fork every day or so. It will last at least 1-2 weeks. Alternatively use an ice cream maker -but you won’t get that ‘homemade’ satisfaction. This entry was posted in Recipes, Supperclub and tagged Dessert, Ginger, Rhubarb, Sorbet, stem ginger, Supperclub. Bookmark the permalink.